Reusable squeeze pouches No doubt you’re famil­iar with those uber-popular pouches of baby food, fruit purees and apple sauce from com­pa­nies like Plum Organ­ics, Peter Rab­bit Organ­ics and Ella’s Kitchen. Even Star­bucks sells them these days! Now, thanks to the Lit­tle Green Pouch, you can make your own. The BPA– and phthalate-free, 6-ounce plas­tic pouch can hold any­thing from home­made apple­sauce to yogurt to warm oat­meal. It has a zip­per seal at the top that allows you to open and fill it. The set of 4 pouches will set you back $14.99. But that’s not bad con­sid­er­ing the store-bought pouches typ­i­cally run $1.50 to $2.50 a pop. Smoothie pop molds I dis­cov­ered these via Lisa at 100 Days of Real Food (a fab­u­lous blog about striv­ing to eat unprocessed in a preter­nat­u­rally junk-filled world). I just love her idea of fill­ing them with home­made smooth­ies then pop­ping them in the freezer. She says the frozen pop is usu­ally thawed by the time her daugh­ter eats lunch. 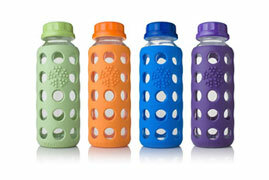 They are made of sil­i­cone, dish­washer save and BPA-free. Ama­zon sells a set of four for $9.26. Glass bev­er­age bot­tle with sil­i­cone sleeve My kids bring water bot­tles to school, but occa­sion­ally I like to add a milk box or some other sort of drink option. How­ever, I hate all the pack­ag­ing waste, and those organic milk boxes are pricey. So I’ve been shop­ping around for a small reusable bot­tle. Many of the stain­less steel con­tain­ers that I checked out were either too big or got some bad reviews for hav­ing a metal­lic taste. Made out of thick and durable soda lime glass, the Life­fac­tory 9-ounce flat-cap glass bot­tle ($14.99) looks like a win­ner to me. It fea­tures a col­or­ful sil­i­cone sleeve to lessen the chances of break­ing. 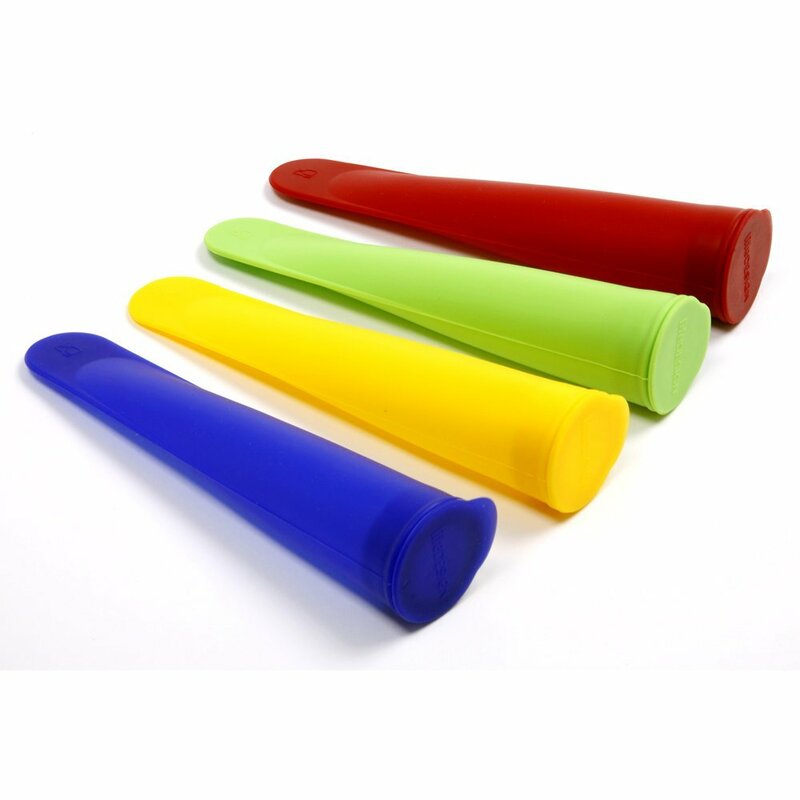 The whole thing (includ­ing the sil­i­cone sleeve and cap) can be thrown in the dish­washer. I think the pos­si­ble down­side would be the risk of los­ing the cap, which isn’t attached to bot­tle. But I guess that’s why replace­ment caps ($4.99) are sold in sets of four. Got any great lunch gear that you just can’t live with­out? Please share it by leav­ing a com­ment in the box down below. I’m with you on the thin resolve to stop buy­ing eco-friendly sup­plies. Those glass bot­tles are the best. Haven’t seen those smoothie pop molds, but awfully tempt­ing. Thanks. Katie, I couldn’t agree more! Thanks so much for stop­ping by! I have sim­i­lar smoothie pop molds and I LOVE them! (Not to weaken your resolve or any­thing 😉 But that reusable pouch is really cool…kids LOVE eat­ing from those squeeze pouches but I just can­not bring myself to pay the money or keep throw­ing them away…but I am really tempted to give these a try! Alissa — Ahhhh…good to know! I am won­der­ing how those smooth­ies hold up in the lunch­box?!? Oh, and I’m very excited that Lit­tle Green Pouch saw my post and sent me some free sam­ples. I can’t wait to try them out! 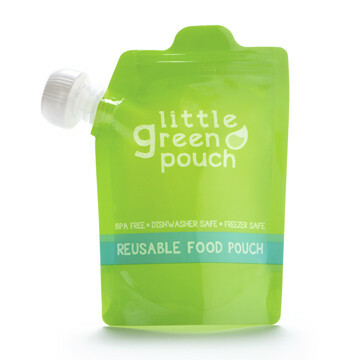 I real­ize this is a fairly old post, but if you haven’t tried the reusable food pouches yet, you should! I have a few sim­i­lar ones that I use for myself. I keep a few filled with oat­meal in the fridge for crazy morn­ings. After 30 sec­onds in the microwave, I have a healthy break­fast I can eat while dri­ving to work!